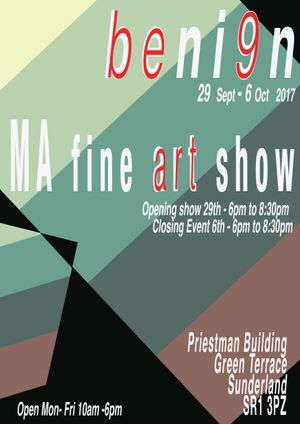 'Beni9n' is the final exhibition of the MA Fine Art at the University of Sunderland 2017. The exhibition features the work of the nine artists on the programme and is the culmination of an intense year of practice and research. The exhibition opens on Friday 29th September 2017 6:00pm - 8:30pm and closes with an event on Friday 6th October 2017 6:00pm - 8:30pm.